Affordable rates – in fact, we doubt you'll find another New York office and business cleaning company that can offer our high standards of service at such a low cost. Professional, uniformed teams of cleaners, janitors and office maintenance staff to keep your business premises in peak condition. Green, environmentally friendly cleaning products to help prevent allergies and safeguard your health. Unobtrusive, efficient and effective commercial cleaning services so that you can work without interruption as we clean. FREE service quotes – contact us now to find out how very affordable we are! A clean, healthy, comfortable office and business environment is crucial if you want your employees to give their best. A fresh-smelling, spick and span, organized workplace will boost staff morale, help to maintain high productivity and create a pleasing first impression for your customers and clients. Our highly trained teams of professional janitors at CLA Commercial Cleaning will keep your work environment looking great, smelling fresh, well-maintained and problem free at all times. We are dedicated to going one step further than other New York cleaning companies to keep your place of work comfortable and inviting - always. That is why we use the latest cleaning equipment, and the most innovative and efficient techniques. All of our employees are fully trained in our rigorous cleaning methods before they can work for us and wear the name CLA Commercial Cleaners on their uniforms. We understand that every business functions differently so we work around the clock and adapt our flexible cleaning routines and times to suit your premises, needs and budget. Through cleaning, disinfection and sanitization of kitchen areas, including microwaves, coffee machines, refrigerators, etc. Any other office cleaning services you may require. 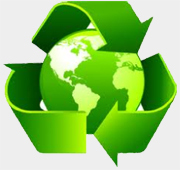 CLA's Commercial Cleaning has access to the most environmentally friendly 'green' products to safeguard your employee's health and ensure that their work environment is as safe and allergy- and odor-free as it can be. It is our mission to provide our customers with the best quality and the best value while offering the most comprehensive commercial cleaning services throughout New York and Tri-State area. Hiring CLA Commercial Cleaning to work for you will give you peace of mind knowing that your staff, customers and clients can enjoy a clean, safe, productive and healthy work environment at all times. 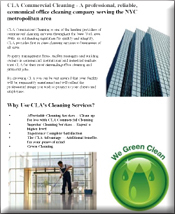 Commercial cleaning services – CLA is dedicated to providing professional customized commercial cleaning services to offices, business, and buildings, both commercial and residential, at affordable rates. We also provide and offer residential cleaning too. Contact us for a FREE estimate by calling 646-532-3750 or fill in our online Janitorial Quote form to schedule a no-obligation walk through to assess the cleaning needs of your New York City or Tri-State office or commercial building.